So next up is the Buttercup Cow Family. I guess you all have had enough of them and their spectacular house. So sorry for that, but they are after all one of my favorite families, definitely top 10 and maybe around 5th or 6th over all. 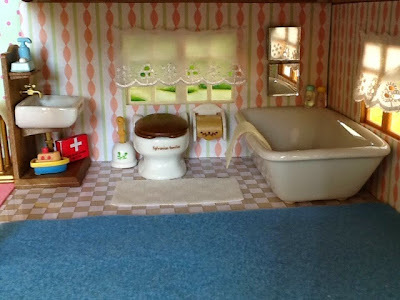 Their house on the other hand is my most coveted Sylvanian item (even though I do own the JP small school and JP small clinic buildings, as well as the Meadowcroft Cottage). So stay tuned for many more episodes of the daily lives of the Buttercup family. Otherwise please leave now. The Buttercups was the 5th family that I received (though Cheddar came much, much later - the little devil just didn't want to join his family). Contrary to the other three families (the Maces, the Fieldings and the Mulberries) that I've blogged about, the Buttercups were love at first sight. Not only are they cute as individuals, but as family they just have a certain something about them, that I love. I grew up on a dairy farm and though our house was nothing like theirs, I did try to take some inspiration from it. Like the hurricane lamp at the front door and the small gas stove on the fridge, as one just never know when the electricity will go out. Furthermore, Annabell is nothing like me, or like I was and the same applies to Paddock and my brother. My mother and Daisy could not be more different, but I really try to base Hornbull on my father (though my dad will never wear a red scarf). A full view of the beautiful Highfields farm, which I have finally completed decorating. The ground floor. Daisy is extremely proud of the living room and the kitchen, Hornbull about his dairy products! The second floor with the parent's room, bathroom and children's room. 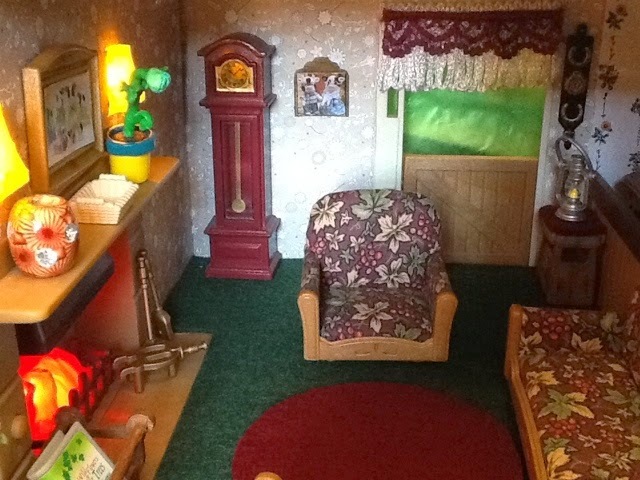 The small attic room with the nursery. 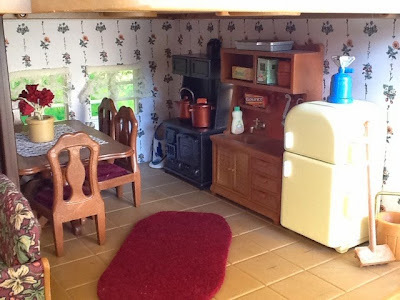 Kitchen: I think it looks very "farmy" with the black stove and the coal bucket in the corner. Also the broom and bucket was a must. Living room 1: This is the room I like most. Maybe it is the fireplace or the clock, but it does look cosy and just like I imagine a farmhouse living room should look. 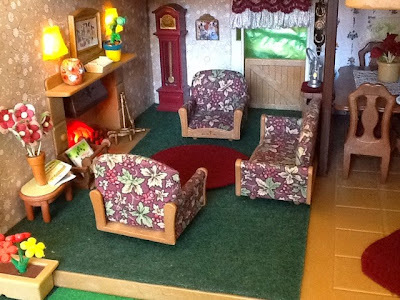 Living room 2: A "closer" close up. Parent's Bedroom: The brass bed and furniture was something that was non-negotiable. 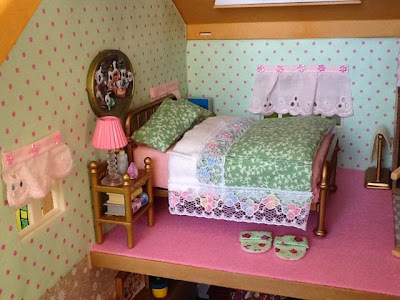 It took a while to get the the pedestals as it is part of this set, but that bed was just too big in my opinion. The brass vintage bed and the pedestals actually fit together perfectly. Children's room 1: Again I just had to have the vintage bunk bet set. I love these because though it is a set they don't look the same, which is perfect. It also fitted perfectly with the coat rack and small drawer which I purchased from Beverley. The bedding I got from a local miniature seller in South Africa. 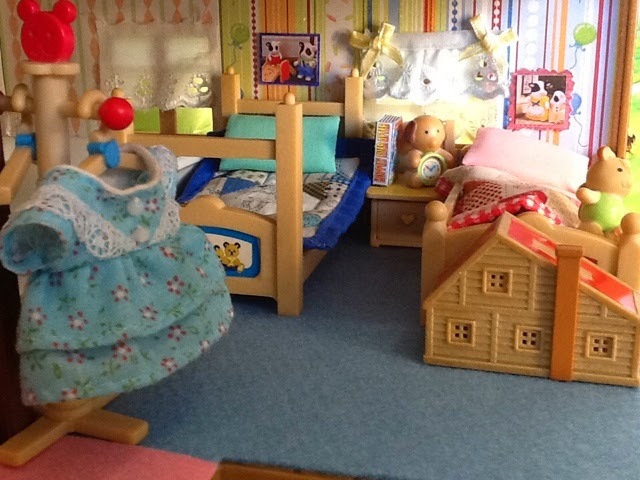 Children's room 2: A different angle. Bathroom: This was the hardest space to decorate, I wanted it to be functional and nothing modern or over the top. But in the end I think it looks good, with all that should be there. Nursery: This room is shared by three busy little babies: Cheddar, Fennel and Dolly. I wanted it to be fun, but also look like a nursery. Unfortunately, I had to stuck with conservative colours as Cheddar don't like pink very much, and Dolly is afterall outnumbered 2:1. Proud Farmer Hornbull. 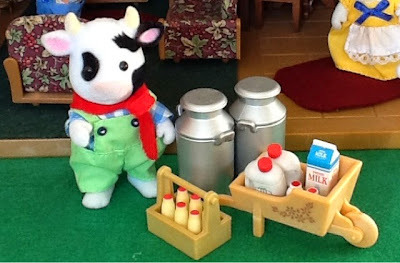 Everyday he supplies the little village of Sugarbush Valley with the freshest milk and other dairy products. Daisy runs a little ice cream cart in the village square. 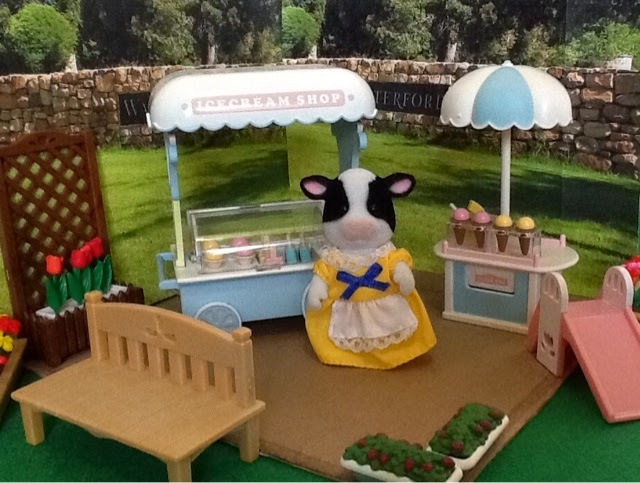 It is quite an exclusive stall as she only sells ice cream that is made on Highfields farm from the milk that is produced there. The stall is getting quite popular and Daisy might have to call in some help soon. Do visit the the-houses-in-the-valley and the-villagers-and-their-jobs pages for more!. Yes those sets are extremely special. It's a beautifully decorated house! I think the farm house is probably a difficult house to photograph because it is so deep but you manage to show how wonderful it can become! The brass bed is something I always wanted as well but I was not sure it would fit inside my house. Thanks to you pictures, I think I now have an idea :) I agree with Sigrun, everything clicks together and that's what makes this house so special. You did real good on this one. The living room chairs are not something I would usually like because of the strange color and flowers/leaf design but it looks GORGEOUS in your living room! Ah you make me want to buy it! Don't feel bad positing about this family. They are too cute and how your stories about them are always so much fun to read! It is quite deep and dark, but I just love the roominess of it. And yes that bed is big. I initially bought it as the Whiskers parent's bed for Meadowcroft cottage, but it just wouldn't fit. I even think in the houses like Beechwood Hall and Cedar Terrace it will not work, not even to mention the cottages, so either the farm or one of the mansion. Thanks again for your lovely comment I do appreciate it! 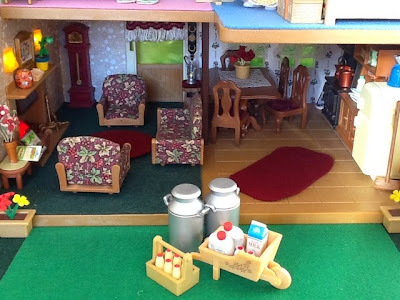 Your farm house is so beautiful, when I first saw the picture of it, I fell in love with it. And with every new decorated room I felt more amazed. You've done a wonderful job, I nearly could be envious of the Buttercups, that they're living in such a cute house :D. Every room is perfect. Thanks for the kind comments M. I think idyllic is a very accurate description of my Buttercups! I just love them to pieces. They are called the ice-cream rabbits, and looked very similar to the one you mentioned....... It might not be the one, but they looked pretty much the same. 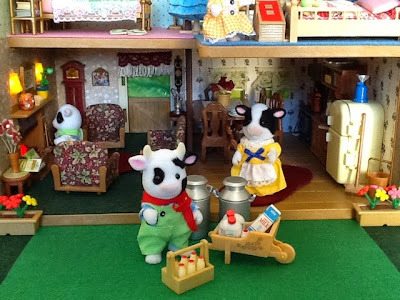 Oh yeah, and if you could check out my blog, about sylvanian clothes, it would totally make my da- I mean year!!!!! Thank you Lucy and welcome to my blog. 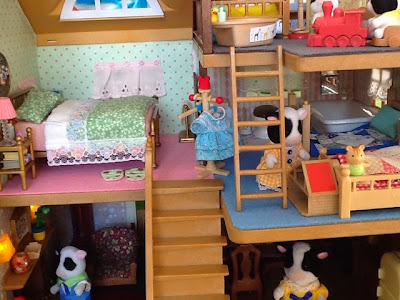 If it seems if I have many Sylvanians you must join the SF forum and you will be amazed or how big some collections are. 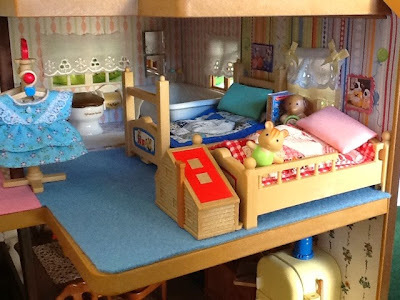 Go here http://sylvanianfamiliesforum.co.za/phpbb/index.php. 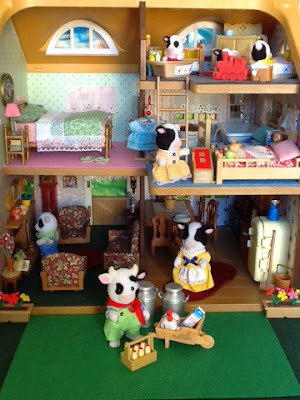 I love your Buttercup cows! 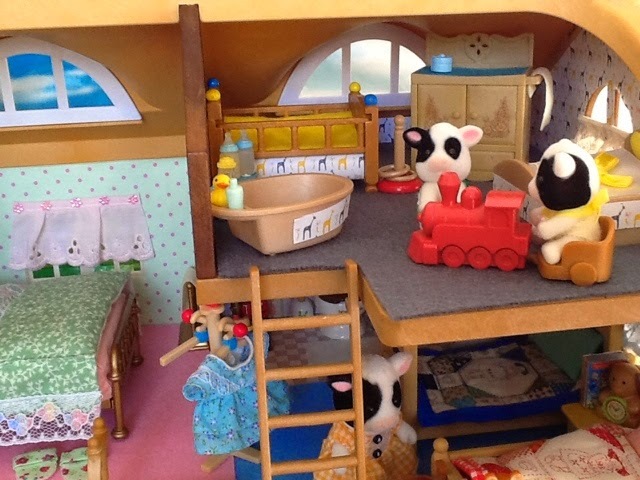 They seem right at home in Highfields Farm: it is the perfect size and the furnishings are so cute and homely. I love your vintage kitchen, some of those pieces look like fairly old releases. Of course, they fit right in to the country style home! 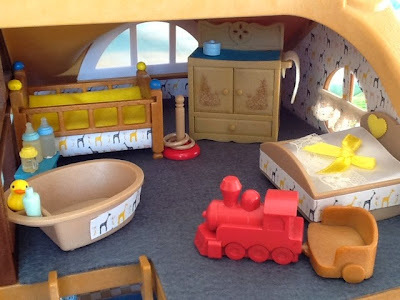 Also, the nursery furniture is to die for! I love the decorative trim you have put on the pieces, it ties them all in perfectly. Thx Mia, your comment are so kind. I do appreciate it! All of those items are rather oldish, but not rare. I love the nursery items very much too.